What Is Inoperative PF Account? When the EPF account is categorised as inoperative PF account the reason behind is that no deposit has been made into the Employee Provident Fund account in last 3 year (36 months). In most cases, the people forgot or don’t transfer their PF Balance while they were changing their job. So, those accounts are listed as the inoperative. Do you get any interest on inoperative PF accounts? NO, the accounts under employees provident fund organisation which is listed or marked as an inoperative account, those accounts will not get or receive any interest on the PF balance, though You might also lose the interest on your PF account as well. 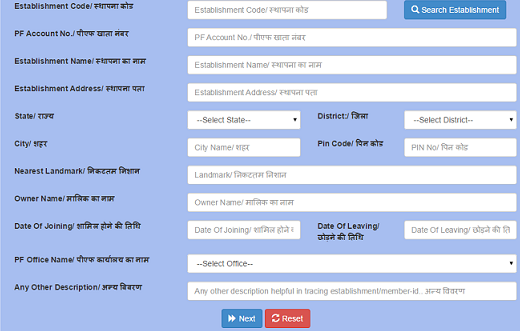 Have all details of your old PF account? What to do now? When Employees Provident Fund Organisation (EPFO) has launched the online helpdesk the biggest motive behind this was to help and give power to their subscribers/members to trace or track their inoperative account. The second biggest step behind this is that it will help members in locating their account if there is a lack of required information on their side, It will also assist the members in claiming the money lying in the accounts. like, Subscribers will have to fill in details such as the year of working, company name etc. By filling these details the helpdesk can assist in finding some other details. When the subscriber/member provided the details available about his/her inoperative accounts, you’ll get a reference ID which will give you the flexibility for future about reference and tracking. ► The first step is to visit the official portal and find and click onto a link named “Inoperative A/c Helpdesk”. ► When you successfully filled your problem and clicked the next button in the previous step, You’ll now re-direct to a new form in which you have to fill in as many details as possible(but correct) related to your company & your personal information. NOTE : At the top right corner there is a section name ”  Search Establishment” that you can use to locate your old employer. ► When you successfully filled in all the required information correctly, the next step is to hit the “Generate PIN” button. When you generate the pin you will receive it by SMS on your registered mobile number. You must enter the received PIN to get your “Reference number” in front of your screen. Saving the reference number is a must. You will also get “Acknowledgement” which you can print out and save it for future reference. What will happen after submitting the request to the helpdesk? When the member successfully submitted his/her request to the online helpdesk, the generated query will be transferred to the EPFO’s Field Officer. This will only happen when the member has provided his/her old company’s Establishment code. When the member has not provided the Establishment code, their request is transferred to the EPFO helpdesk (centralized). The EPFO Helpdesk will now call the member to get more deep details and when they get it the request will be forwarded to the field officer to trace the old & Dormant EPF account. Enter the mobile number & reference number to check the status of your request. ► In case, the member forgot His/Her unique reference number, there is a link right after the Reference No. section named “Forgot Reference No. ?” and it will pop up a new window in which the member has to enter his/her Date of Birth (DOB) & registered mobile number to receive the reference number. 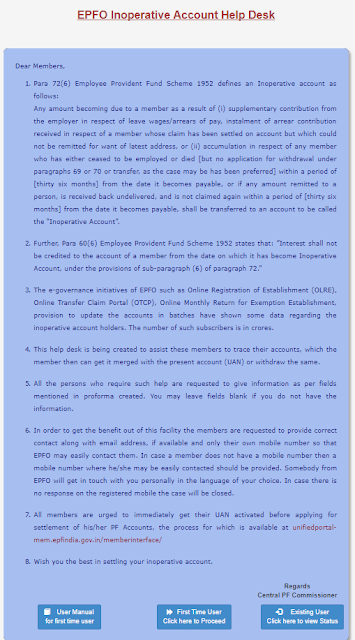 ✓ The Email-ID is not mandatory but if you provide it, the EPFO will contact/reach you much easier. ✓ While filling in your request, try to mention as much deep details as you can. 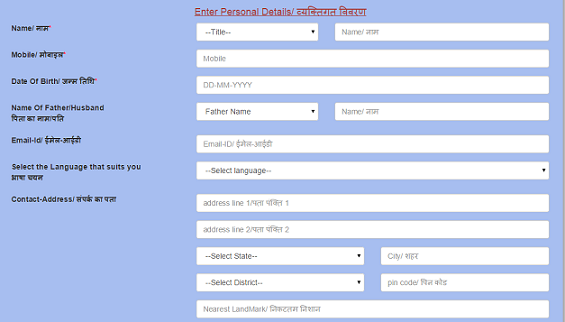 ✓ You can also contact your past employer’s to get all details related to your previous EPF account. What are inoperative EPF account? how I claim my inoperative EPF account?